» Articles » Trees » Sweetgum Tree: Friend or Foe? Sweetgum Tree: Friend or Foe? 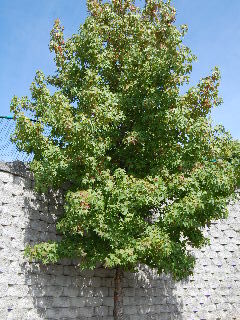 Liquidambar styraciflua is the scientific name for the sweet gum tree—a popular urban landscaping tree. I like that, don’t you? A really bold and intimidating formal name is the business designation for what is actually a very commonly utilized and often seen neighborhood friend—the sweet gum. Let’s deal with the businessman first (or should I say “business tree”?). The wood of the sweet gum tree does indeed have much economic value in the production of furniture, veneer, and lumber. The wood is rather hard and heavy, making it not so easily marred, dented, or scratched when it is in place in furniture applications. Also, the heartwood is dark in color (often a reddish brown) and with a figured grain that gives it an attractive appearance. 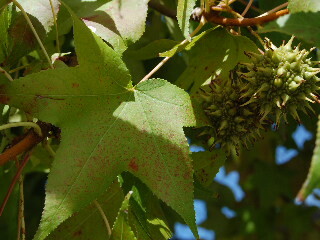 The sweet gum tree is native to much of the eastern and southeastern United States, not occurring naturally in the western states or the colder northern states. The tree likes a sunny location and can often be found growing in rich moist bottomland sites, where it can reach heights exceeding 100 feet. However, most of us are more familiar with the sweet gum tree because of its utilization in urban landscaping environs, where its attractive oblong shape, distinctive star-shaped leaves, and brilliant red and gold autumn foliage give it its desirability. Another distinctive and unusual feature of the sweet gum tree is its seedpod. These burr-like globes are generally about an inch to an inch and a half in diameter, bright green turning to deep brown as they mature and dry in the late summer and early fall of the year. “Therein lies the rub,” my grandmother would say. In other words, this is where a bit of a “sour” attribute rears its ugly head in the story of this, so far, sweet little gum tree! It’s those innocuous looking little green seedpods hanging on the tree that become mean neighborhood kids when they turn brown, dry, and fall to the ground. They’re a real pain and nuisance if you have to mow over them. (They don’t decompose so easily.) And, speaking of pain, you really don’t want to step on one of those dried seedpods barefoot! On the positive side, if anybody in your house is into crafts, you’ve got some ready-to-use and free for the taking raw material to work with. Spray paint them gold or silver and use them in the making of Christmas wreaths or other seasonal decorations. So, there you go—now you’ve met your friendly (?) neighborhood sweet gum tree, complete with all its positive and negative attributes (just like everybody else in the neighborhood, huh?). If you already have one in your yard, “Merry Christmas.” (Aren’t you lucky to have all that free craft material?)!!! !